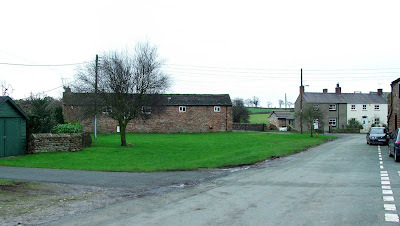 The small village of Temple Sowerby lays on the A66, about 2 miles East of Penrith. 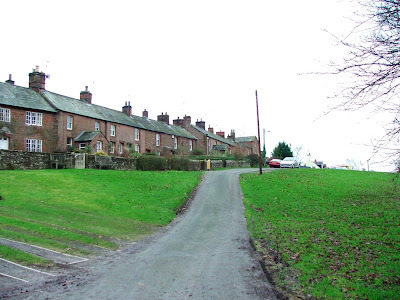 Just like Askham and Milburn, it is a defensible village, displaying many of the same characteristics as Milburn. Built around a central village green, the defences here again consisted of unbroken rows of stone built cottages, effectively forming a light curtain wall, within which the inhabitants would have been able to easily and safely protect their livestock. Originally called Sowerby (relating to the poor quality farm land thereabouts) it became Temple Sowerby when the Knights Templar gained possession of the manor sometime around 1228. 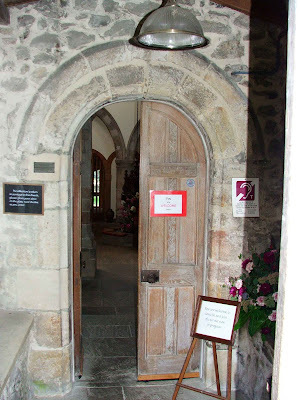 In 1312 and again in 1323, the manor was given to the Knights Hospitallers when the Templars were accused of heresy by Pope Clement V. The manor remained under the Hospitaller's control until given to a local family by Henry VIII in 1545. As at Milburn, the houses surrounding the green would at one time have formed a nearly unbroken ring of buildings around the central green. But Temple Sowerby has been developed far beyond Milburn, and the Green is now less distinct than at Milburn....and many buildings have been replaced and altered. The basic shape of the village remains however, and there are still unbroken rows of low built cottages to this day. 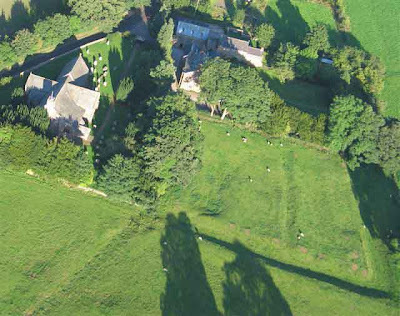 Check out Simon Ledingham's aerial photo of Temply Sowerby. The small village of Milburn lays about 3 miles to the East of Penrith, and just off the road these days called Mill Lane. The village is set out around a four and a half acre green, with houses built in a single row down each side and at the ends of the green. 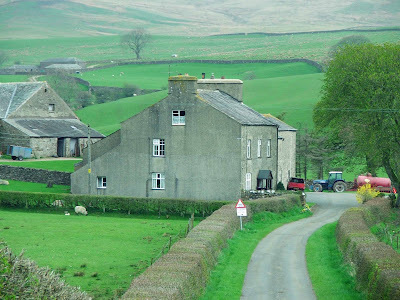 There are some excellent photos of Milburn on the Visit Cumbria web site. These photos clearly show the lay out of the houses, and illustrate how, even today, the village retains its original layout to a high degree. Milburn is one of only three sites representing defensible villages in the old county of Westmorland. The others being Askham and Temple Sowerby. Each village still retains some, if not most, of the original layout. 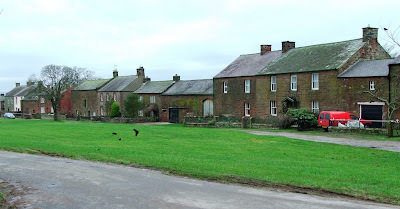 The layout at Milburn consists of the four and a half acre green, with rows of stone built cottages all around the green. Most of the cottages are still joined.....only in a few places have buildings been demolished and replaced with free standing properties. This continuous row of buildings would have formed a very basic barrier to livestock getting out, or being removed by raiders, and to raiders gaining entry in the first place. Most of the cottages would have had tiny windows facing out from the green, and possibly no ground floor windows either. The small windows may have been designed to prevent entry by anyone planning a raid, but may just as easily have been simply to prevent heat escaping from the houses in this windy and cold part of the county. However...and this is the rub...there are barely any remnants of 17th century houses that would have formed the original 'domestic ring of stone' around the green. Most of the properties now date from the mid to late 18th century, and many more reflect a great deal of rebuilding that took place during the 19th century. Lucky for us though that these periods of rebuilding followed the original village plan. Anywhere that there was a gap, for example in the corners of the green, a fence could simply be erected at nightfall or during the winter months....thereby preventing or at least deterring anyone from attempting to enter the village, and preventing livestock from wandering away. It's plain to see that this type of defence would not have withstood even the most lightly armed and determined army....but groups of mounted raiders, as so often seen on the English and Scottish side of the border throughout the middle ages, would probably have had a tough job gaining entry, and then escaping with cattle and other livestock. Check out Simon Ledingham's aerial photo. It clearly shows how the village is set out, around the central green. There are not many sites that can boast so many fortified remains. Ok...London maybe, and York and Chester....but a tiny village such as Great Ormside, doesn't seem to be the place that you'd find a pele tower, a medieval (and older) ring work and a fortified church. I almost didn't bother visiting this small collection of houses, about two miles south of the A66 and about a mile and a half south of Appleby, as time was running short. I'm glad I did however. First off Ormside Hall. 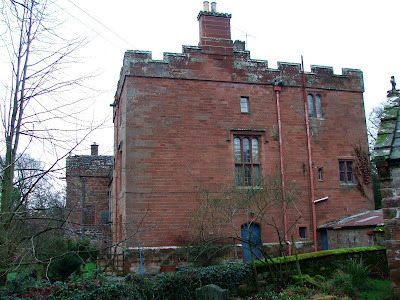 The hall was the seat of the Barton family, and was probably built sometime in the latter part of the 14th century. It passed to Sir Christopher Pickering in the late 16th century, and then to the Hiltons in the 1700's. The pele tower can be seen on the right hand side of the photo below, attached to a later 17th century house. Originally the tower would probably have had a flat roof, possibly with crenellations, but as so often happens with these buildings, when they are converted to primary residences, and the need for defence recedes, steepled\gabled roofs are often added. The second site here, is the ring work upon which the church of St James is built. Above. A view of the church sitting on top of the ring-work. The summit of the ring work measures around 50m by 35m, and sits high above the River Eden (Ormside Hall is less than a hundred yards away) The site is certainly very ancient, with a Viking burial being found here in 1898. Above. View of the ring-work. Aerial photos of the site on the Visit Cumbria web site ( Link 1 and Link 2 ) clearly show that the ringwork was built in a good defensive location, with open views across the surrounding countryside, and a prominent position above the bend in the river. The third site, is the tower of the church of St James, built high up on the top of the ringwork. 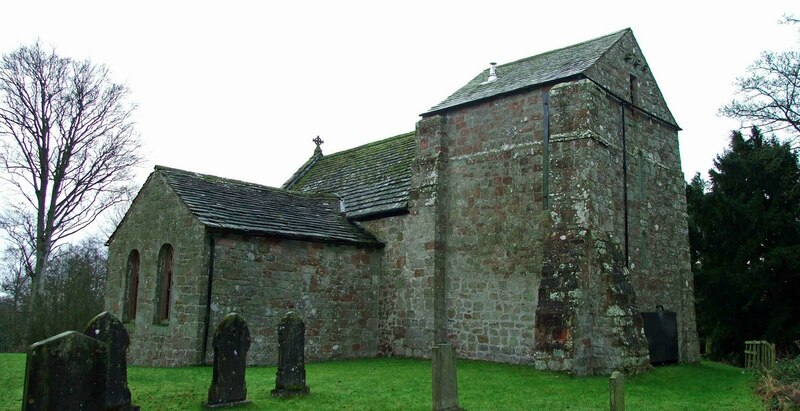 The church, which dates from the 11th century (making it one of the oldest in Cumbria) has no doorway in the outside walls (existing or blocked) and no windows, save for some narrow slit like openings on two external walls. The tower would have been entered only from the inside of the attached building\church\chapel. There are still 12th century windows in the south side of the nave, and 12th century walls to the East of the tower. These remains may indicate the last vestiges of the original building to which the tower was originally attached, and in which locals may have sought refuge in times of danger! Above. 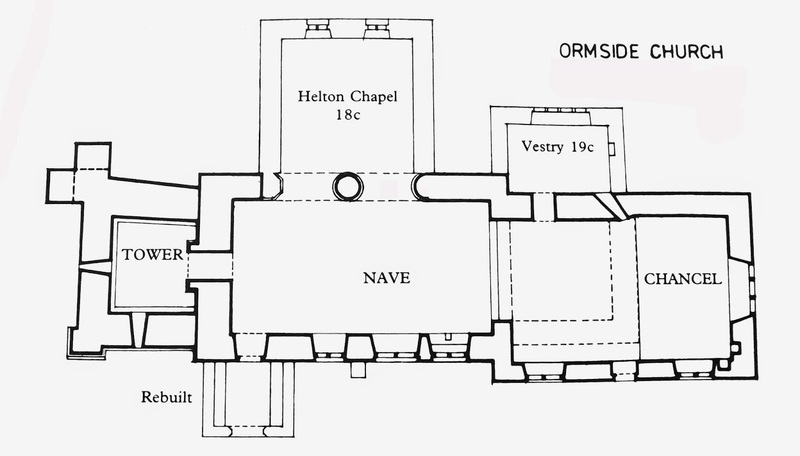 Floor plan of the church. The tower's walls are up to a metre thick, and with its position high above the surrounding countryside, it's not hard to imagine this building as a defensive structure. I think the lack of an external door, and the thin slit like windows also adds strength to this idea. However...there doesn't seem to be any definitive description of the original use of this part of the building. More information as it comes to hand! The Hall can be viewed from the footpath that runs around the base of the church yard. The church especially the tower can be freely viewed at any time. Newbiggin Hall is a collection of buildings, the earliest of which dates from just after 1322. A large degree of rebuilding and redesign was undertaken in the 1500's, with further additions and changes made in 1533, 1796 and 1846. The hall backs onto the church of St James, and it looks almost as if the Norman and 14th century church may have been a private chapel to the original pele tower here. One tower here, the Jerusalem Tower, was built around 1460, and was used as a refuge for the Crackenthorpe family when they were fighting in the Wars of the Roses. The Crackenthorpes acquired ownership of Newbiggin in around 1332, just after the first tower was built. The hall and its grounds are private, although limited views can be had from the graveyard of St James, and from the bridge over the beck just beyond the church. The small church of St Columba, which dates from the 12th century, backs onto the remains of a moat in the field behind. The moat is still fairly well defined, with earthworks surviving to a depth of about 3 feet. The moat has been obliterated by the vicarage to the East, but about two thirds still survives. Above. The moat viewed from the church yard. There is documentary evidence of a castle in the small village, but it's not thought that this would have been situated at this site behind the church. Above. The moat viewed from the road side. 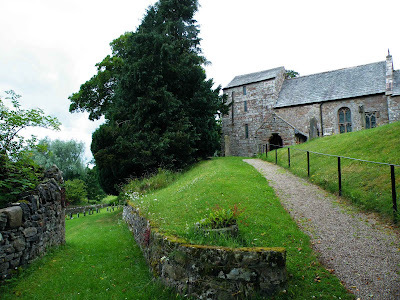 J.Nicholson and R.Burn, in their History and Antiquities of the counties of Westmorland and Cumberland, state "The vicarage house hath been anciently moated round, including the garden, orchard and outhouses....with a drawbridge at the entrance." 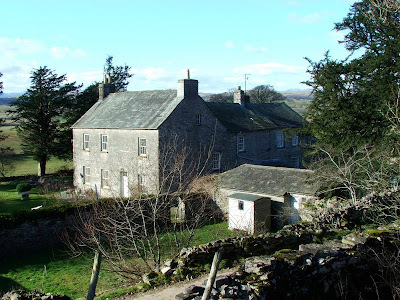 Likewise, W.Parson and W.White, in their History, directory and gazetteer of the counties of Cumberland and Westmorland, state "The vicarage was rebuilt a few years ago, and appears to have been anciently moated around." Nicholson and Burn's account was written in 1777, and Parson and Right's account in 1829. Historical documents state that the vicarage was moated due to its close proximity to the Scottish boarders. The moat can be viewed from the graveyard behind the church, although the undergrowth is very thick. Warcop Tower belongs to the same group of buildings mentioned earlier in this blog...houses that may....or may not be, or have the remains of towers contained within their cores. 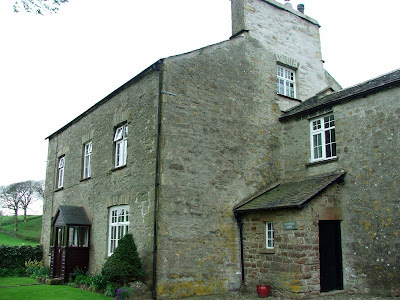 The house as we see it today, is sited in the small village of Warcop, just off the A66, and about 4 miles West of Brough. The house probably dates from sometime late in the 17th century, but the small site was certainly the site of the medieval manor here in Warcop. The Warcop family held the manor here since the 13th century, and were most likely based near or at the present house. The house is a private residence, but can be seen from the road running through the middle of the village. Millrigg is one of those great houses in Cumbria that hides the fact that it may once have been more than simply a house. It sits about half a mile from the A66, and about three quarters a mile north of Temple Sowerby. The house sits on a gentle rise, overlooking the river beneath it. It's thought that the house was built in 1597, possibly as a small tower or 'strong house', for Henry and Bridget Birkbeck (as named on a date plate above one of the doors) The same year, the house was sold to John Dalston, who's initials appear on yet another plate above a door at the rear of the building. The Dalston coats of arms also appear above the same door. The house may have an earlier core, although details of the building pre-1597 seem to be almost non-existent. From the outside, this looks like one single building, though an interior examination by Peter Ryder, showed that there were possibly two buildings butted up against each other. The building has retained many original features, such as door lintels, windows and fireplaces. The house is private, but can be viewed clearly from the nearby road. Possible pele towers in the South Lakes area. There are a number of buildings in the South Lakes area that are either built on the site of pele towers\towers, or contain masonry from these old buildings. Such was the obvious perceived danger from cross border raids, that the number of fortified dwellings in the area is quite amazing. Some of these buidings survived in one form or another, whilst others were evenutally dismantled, and the fabric used to build new dwellings with no defensive capabilities. 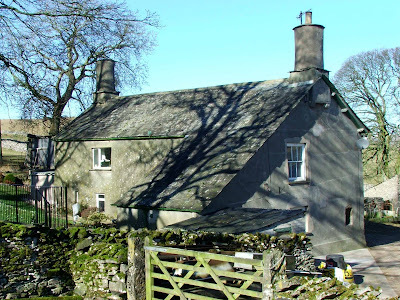 There are three, such buildings in Kendal alone, Benson Hall, Cunswick Hall and Helsfell Hall, both with well documented defensive characteristics, but now no more than houses incorporated into working farms. In the case of Helsfell Hall, even the location is up for debate. 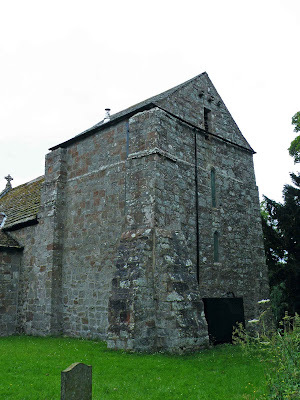 Meanwhile, in Grayrigg, another current building is reputed to either contain some masonry from a pele tower, or to be built on the site of a pele tower. Cunswick Hall lays West of the A591, and South of Cunswick tarn. It's likely that the current house contains masonry from the dismantled pele tower that would once have sat behind the gatehouse that still exists. The pele tower was built sometime in the late 16th century by the Leybourne family, who owned the site until the 1800's. The house is said to contain some of the oldest glass in Westmorand, mounted in a 16th century mullioned window...possibly from the earlier tower. The gatehouse, at the South end of the farm yard, is in excellent condition, but I was unable to access the farm to take any photos of it. A footpath runs right alongside the farm yard, affording excellent views of the house. 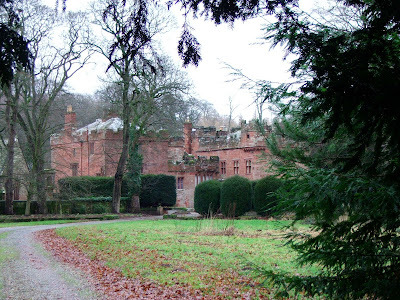 The site of Helsfell Hall is a matter of great speculation. 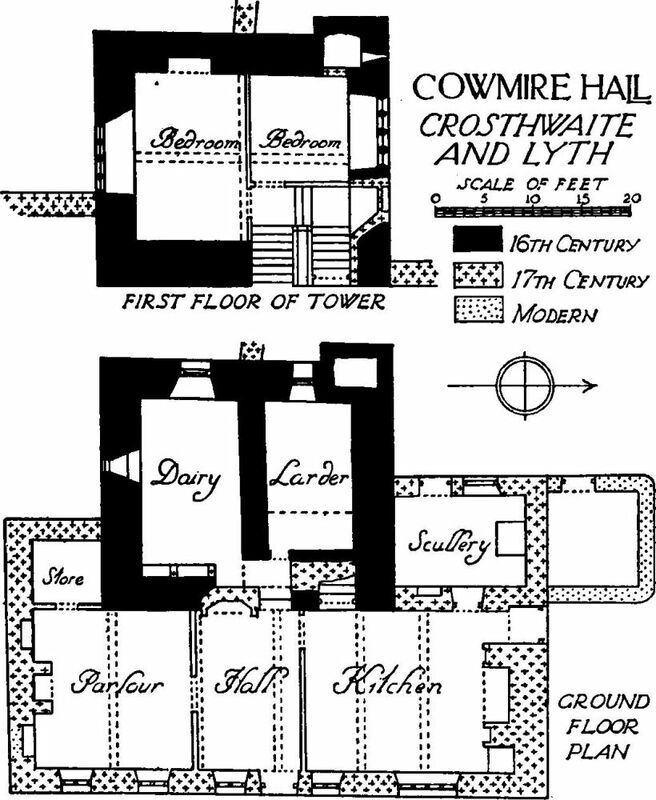 There are three possible sites for the original fortified hall\pele tower. The first speculative site, lays just South of the Plumgarth's roundabout, and to the West of the A591. 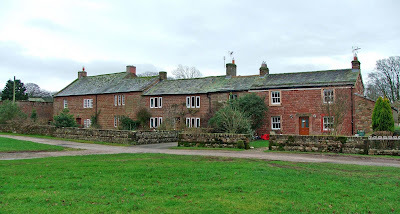 The current farmhouse, shown here, is probably not the original Helsfell hall. 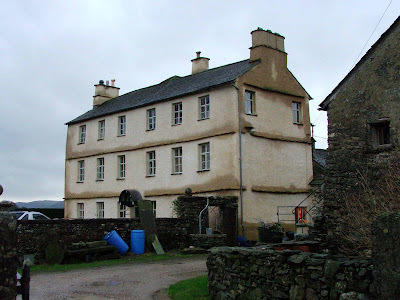 It is in fact a late 17th century house with the familiar Westmorland round chimneys. 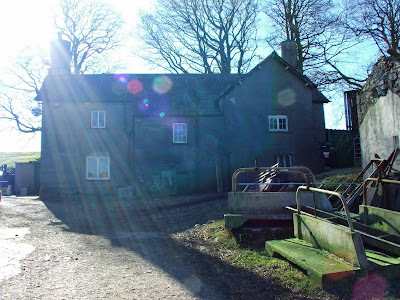 The second site is a barn that lays about a mile and a half to the South, in a field above the A5824 that runs from Plumgarth's roundabout into Windermere Road above Kendal. This barn was probably built in the late 16th century, was definiately inhabited at some point, and is still intact and used by the farm for storage. This building has the original windows with moulded labels, now blocked and thick walls, and may have represented the original hall with its light fortifications. I haven't visited the 'barn' yet, but as soon as I have photos of it, they will be posted here. The third site, and marked on late 17th century, and early 18th century maps as Helsfell, is at the top of Windermere Road and at the foot of Kendal Fell. There are no original buildings here now, but the site has been redeveloped recently and is now occupied. Helsfell Hall (wherever it may originally have been) was home to the Phillipson family, a locally landed family. It's possible that the only remains of the original building, are some original re-set mullioned windows (relating to the present Helsfell Hall) Probably the most famous (local) son of the Phillipson family, was Robin Phillipson, known as Robin the Devil....so called after he rode into Kendal Church on horseback, whilst chasing an adversary, Colonel Briggs, and losing his helmet and sword on the way out as he was set upon by the church congregation (so legend has it!!) The sword and helmet are still to be seen today, mounted high up on the church walls. Grayrigg Hall, about 200 yards north of the A685 in Grayrigg, is a mid 18th century farmhouse, either built on the site of an earlier fortified house, or incorporating the remains of it. The original building was the home of the Duckett family. The Remains of John Briggs, published in 1825, describes Grayrigg Hall as "now in ruins, was a strong manor house, of a quadrangular form, belonging to the Duckets". It was also described as "adapted more for defence than for convenience".....indicating that it wasn't just a house or a home to the Duckets, but a possible place of refuge for them. In 1777, it was described as "totally in ruins, most of the lead and timber thereof, being removed to Lowther". 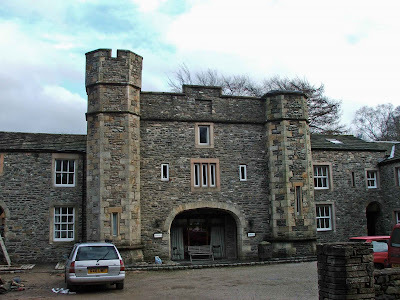 It seems that, in 1670, Anthony Ducket sold the hall and the Grayrigg estates, to Sir John Lowther, and upon his death, the Ducket family name became extinct in the Westmorland area....the hall soon falling into disrepair. I haven't visited Benson Hall yet...but as usual, as soon as I have, I'll post the photos here. Holme Fells to the South. The natural pass created by the river at the foot of these fells, could possibly explain the existence of both the village, and the Norman motte and bailey castle here. Indeed, the earthwork castle to the North of the village, would have commanded a fantastic vantage point over the town, and anyone who needed to pass through either from the West or the East would have had to pay heed to the manor here. The name Sedbergh could well be a Scandinavian name for a 'flat topped hill', possibly referring to the remains of the motte and bailey castle. The castle was most likely built following the Harrying of the North, a destructive military campaign undertaken by William the Conqueror in 1069/1070 as the result of failed uprisings by native Saxon lords and their armies. The result of the nearly total destruction of the area, was the building of a host of motte and bailey castles right through to the 1100's, underpinning the military might of the Normans throughout the North West and North East of England, and indeed, into Scotland. 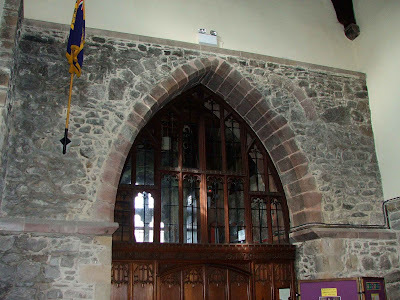 The main (and original) church in Sedbergh, St Andrews, contains the remains of the Norman church built in the village in the late 1100's, mainly, a Norman doorway to the South of the church, and some Norman masonry in the internal tower wall. The motte and bailey castle is very well defined, and is easily accessible. Each part of the earthwork remains is readily identifiable: motte, bailey, ditches and ramparts all surviving intact. The motte stands to nearly 30 feet, and is still surrounded by a well defined ditch which measures around 20 feet at the widest points. The ditch ceases on the South side of the motte, with the natural defences of the steep cliff face taking over. The motte’s summit measures around 9metres by 7 metres. The summit is slightly dished shaped, probably caused by the building of a WWII lookout outpost (with concrete remains also in the bailey below) The bailey laying to the West of the motte, is around 30 metres by 20 metres. The castle may have been erected by Robert to Mowbray in around 1092, possibly the same time that Castle Howe in Kendal was also being built. There is a well marked footpath that leads right to the remains. The site consists of a group of buildings reputedly based around the remains of a 16th century tower house. What is seen today is the result of early 19th century renovation and rebuilding by Kendalian architect George Webster, and subsequent redevelopment in the last two years, turning the ‘hall’ into a number of individual dwellings. The hall burnt down in 1928, but the recent redevelopment has turned this site into prime residential property. Some documents stat that the original tower was at the North end of the site, with a hall range and an additional cross wing at the South end. The tower and all the buildings were said to have been in a serious state of disrepair when George Webster redesigned the site, and the hall had, apparently all but disappeared. The cross wing has been incorporated into the main house\building. George Webster's fanciful interpretation of a pele tower is easily identifiable ….with its tall cylindrical stair tower and overly exaggerated high crenellations. There is still the old gardeners cottage at the entrance to the hall’s grounds, with its tower and crenellations still intact. This was a later addition, designed and built by George Webster, and therefore has no connection with the original tower and house. Inspection of the site and the grounds, probably in relation to the redevelopment, showed no significant archaeological finds of any kind. The hall is now in private hands, but a footpath does run along the driveway and through the end of the gardens, offering fairly good views of the pele tower and the rest of the buildings. Cowmire Hall is situated about 3 and a half miles South West of Kendal, and just off the A5074. The Hall consists of a huge three storey house built in the 1690's by Richard Fleming, and an early 16th century pele tower incorporated into the rear of this house. Approaching the hall from the East, the huge 17th century house is the first visible part of this site. Built to 3 storeys, the house towers above surrounding outhouses, and with its soft creamy coloured facade, it stands out against the greenery. The tower is built onto the Western or rear face of this house, with all but one outer wall swallowed up by the later building. Probably built by the Briggs family in the early 1500's, this is most likely one of the last pele towers\tower houses to be built in the area. The tower's walls are around 1.25m thick, with perhaps a storey in height missing from the top. The tower may have been built more as a prestige building rather than a defensive structure, much like Skelsmergh Hall near Kendal for example. 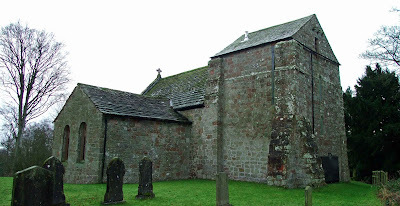 There is a Cowmire Hall pew in the nearby church of St Anthony on Cartmel Fell, alluding to a connection between the Briggs family and the church. 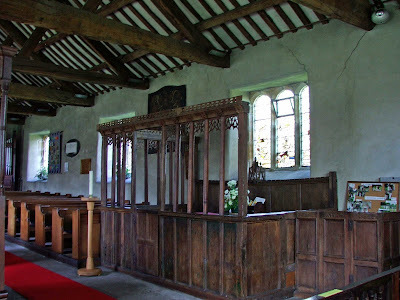 The pew demonstrates the importance of this family in local affairs, being totally enclosed with a screen of single light divisions and decorated to a high degree. The tower now sits over two storeys, with two barrel vaulted rooms in the basement area. 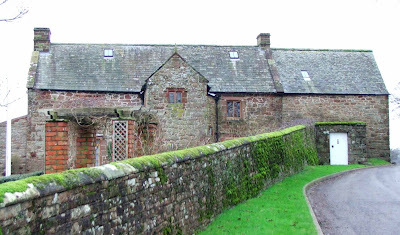 The East wall is completely built into the 17th century external house wall, and it is here that the depth of the walls can be seen. The stair case is a later addition to the tower, probably replacing a spiral staircase. The windows also serve to demonstrate the true thickness of the tower's walls, with the three and four light windows probably being original. Above. 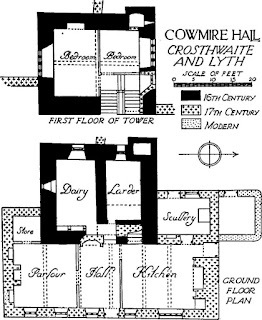 Floor plan of Cowmire Hall. Above. Machel's sketch of the hall and outbuildings. Machel's drawing also shows the tower as part of a larger group of buildings, with an L shaped building to the right and in front, in which a gatehouse appears to be situated. There is some suggestion that the square-raised garden area in front of the house, could be the original manorial enclosure....originally hidden behind a barmkyn or curtain wall...much the same as Beetham or Nether Levens, although on a much smaller scale. The upstairs bathroom utilises the original guarderobe that was, until a few years ago, sealed off from the rest of the house. 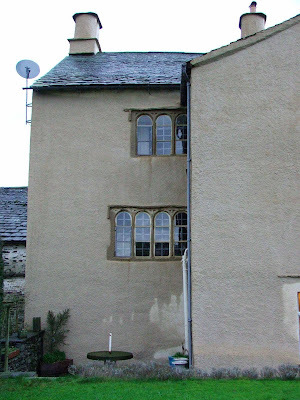 The guarderobe can be seen from the outside as a small projection from the North West wall, with a tiny window, probably once a vent, still visible. These days, after some conservation work on the property, the site provides living accommodation for the owners, rented accommodation in the 'Bothy' in the yard, and premises from which the current owners, the Barratt's operate their Damson Gin company. The owners were very kind in affording me some of their time to show me around, and to point out items of interest. 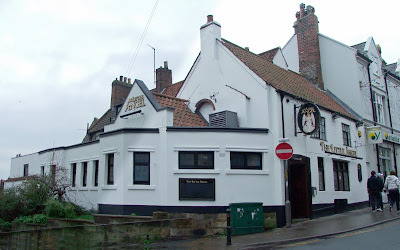 On the South side of Flowergate in Whitby, sits an unassuming inn called the Little Angel. 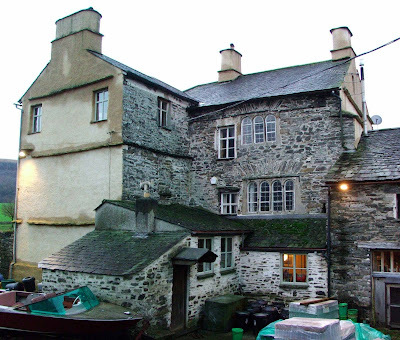 The inn was probably built in in the latter part of the 18th or early part of the 19th century, but may hide the remains of a 12th century castle. The Images of England web site states that the inn may have some masonry from a 12th century castle hidden away within its core. What it doesn't explain is where this information comes from.....whether or not the masonry is from a castle that was on the site of the present building....or whether the masonry has been bought from another site. There are the remains of two castles to the North of Whitby, not forgetting Scarborough to the South. The two sites to the North are Mulgrave Castle, a 13th century stone castle, and Lythe Castle, an earthen motte and bailey castle. Maybe some masonry was removed from either one of these two sites and used in the building of the predecessor to the Little Angel. 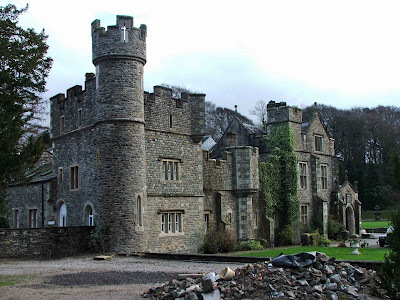 Philip Davis of the Gatehouse web site seems to be 'fairly' happy with the siting of this building as a castle, but there seems to be no information on the internet about its authenticity. When the town was smaller, and not so built up, a castle in this spot would have had a good view of both the estuary and the harbour, and would have been well placed to control both land based and water based traffic. "We have heard this rumour as well, but do not have evidence to substantiate this claim. It is possible that someone assumes a castle because of the 'soke' at Flowergate in Domesday Book...but since Whitby had an Abbey it is rare for there to be a castle as well." A 'soke' incidentally, was the district over which Soke jurisdiction was exercised, a Soke being the right of local jurisdiction\feudal rights of Lordship over an area. So...it could be that the association of Whitby with a 'castle', could purely be down to the entry in Domesday book, and nothing more. 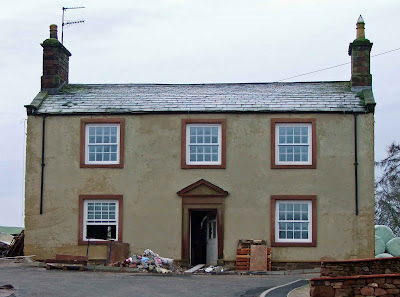 I've also been in touch with the chief Archaeologist at the County Council regarding any architectural evidence for a castle allegedly contained within the Little Angel Inn.....his reply was that he thought it incredibly unlikely that there was any masonry in this building older than that placed there during its initial building in the late 18th, early 19th century. Is this another castle claim blown out of the water?